Olentangy Orange’s Brenna Oliver fires a pitch toward home plate during Wednesday’s OCC showdown against visiting Olentangy Liberty. 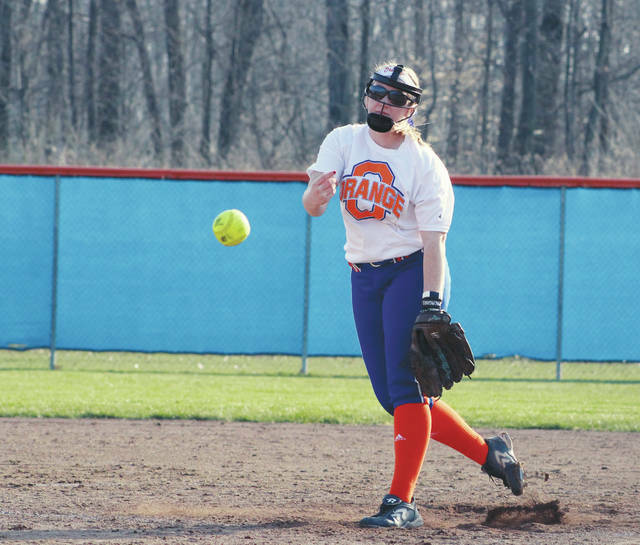 The Olentangy Orange softball team emerged with two runs in the sixth and made them hold up in a good, old-fashioned pitchers’ duel Wednesday in Lewis Center. The Pioneers scored twice in the bottom of the sixth and held off a last-inning rally by rival Olentangy Liberty in a 2-1 victory in the OCC-Buckeye opener for both teams. Orange junior pitcher Brenna Oliver had a perfect game through three innings and a no-hitter through four before Liberty’s Lindsay Aninao finally broke through with an infield hit to lead off the fifth. On the other side, sophomore Kaitlyn Leary was putting up zeros too. She set down the side in order in the first, third and fourth innings, giving up base hits by Jenn Rubal and Alex Ronk in the second and fifth innings as her only blemishes. Leary, in fact, was dialed in – she set down the side in order in the first and third innings on five pitches each. But, Oliver was a hair better. The Patriots could only muster two balls out of the infield through the first four innings. Finally, somebody blinked. Alli Rubal reached on an error before coming around to score on a fielder’s choice to give the Pioneers a 1-0 lead with one out in the sixth. Jenn Rubal drove in Teresa Hawk, who reached on an infield hit earlier in the frame, to push the lead to 2-0. It was a good thing too, because Liberty’s offense finally got something going in the seventh. Aninao led off the inning with another infield single deep in the hole at short and Sydney Lane followed with a groundball single to center. Lillee LaRosa drove home courtesy runner Natalie Battaglia with Liberty’s third hit of the inning. Liberty had the bases loaded with one out before Oliver got a strikeout and a flyout to center to end the comeback bid. Oliver allowed four hits and a walk in a complete-game effort to get the win. She had five strikeouts for the Pioneers (4-4, 1-0). Leary deserved a better fate, giving up two unearned runs over 5.1 innings on four hits with four strikeouts, taking the loss for the Patriots (1-7, 0-1), who dropped their sixth straight. Both teams are back at it today against league competition. Liberty hosts Westerville Central while Orange entertains Westerville South. Both games are scheduled to begin at 5:15 p.m.